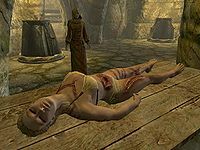 Susanna the Wicked is a Nord rogue who is usually found in Candlehearth Hall, in Windhelm. She is the fourth of the Butcher's victims during the quest Blood on the Ice. She sleeps in Candlehearth Hall from 3am to 11am, then heads outside to wander the city and get some fresh air. At 4pm, she returns to the Hall for work until midnight, when she can be found around Windhelm again. 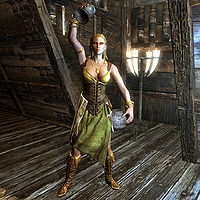 She wears a set of tavern clothes and a pair of boots, and she carries an iron dagger, along with some common items and gold. Despite working at Candlehearth, she will recommend that you go to the New Gnisis Cornerclub: "You didn't hear it from me, but if you want a real drink, try the Cornerclub in the Gray Quarter." She also mentions the history of the tavern by saying "Did you know that candle on the mantle hasn't gone out in over a hundred years?" She also does not seem to see eye to eye with her boss and will often wonder "How can Elda hate the dark elves when she knows so little about them?" When exiting conversations she will often bid goodbye with "See you around, handsome." if you are male, or "See you around, my beauty." if you are female. Elda will advise you to "Mind you don't get fresh with Susanna. She plays the flirt, but it's just to get good tips." According to game data, her boyfriend is Kjeld the Younger. Susanna's body in the beginning of Blood On The Ice, in the graveyard, is refID 000D2C9E, baseID 000D2C9D. It is disabled when you speak with Jorleif about the murders. Susanna's body on a table in the Hall of The Dead is refID 000D5811, baseID 000D5810. The guard present during Blood on the Ice says that Susanna "Served me a drink just a few nights ago" though she doesn't actually sell drinks to anyone else at the inn. She was actually set up to do so, but was never added to the appropriate faction. This issue has been addressed by version 2.0.2 of the Unofficial Skyrim Patch; she will now sell drinks.